flap-jacks co-owner George Stamos (third from right), Manager Mary Janin and restaurant staff present Park Lawn Director of Development Nancy Schmitz (center) with a donation from the restaurant’s fundraising event. To celebrate flap-jack’s one-year anniversary at its Oak Lawn location, 4710 W. 95th St., 10 percent of customers’ dining bills were donated to Park Lawn. The restaurant also matched the amount raised. Park Lawn is a nonprofit organization whose mission is to provide services that promote independence, choice and access to community living for people with developmental disabilities. 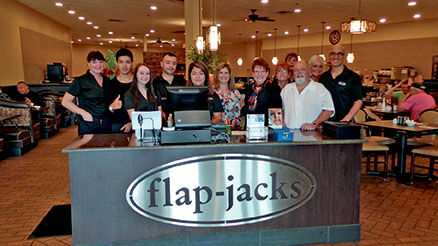 flap-jacks restaurant is a proud family-owned business. We are located just east of the corner of 95th & Cicero in Oak Lawn.